Can You Plaster Popcorn Ceilings? The most important part of painting a bathroom ceiling is the prep work. If you thoroughly prep your ceiling before painting it, you can make a cracked, nicked, or moldy ceiling look like new again. Remove as many objects from the bathroom as you can or put them in the bathroom closet. They will get very dirty if you leave them out. Also, lay a tarp over the floor to make cleanup easier. Open all windows and close the door to promote ventilation. If you have a bathroom fan, turn it on. First you will need to remove any old paint that is still on the ceiling. Use the putty knife to scrap off as much of it as you can. Hold the knife at a low angle and don't scrap the ceiling too hard, or you may dig into the ceiling and create pits that you will have to plaster later. Sand the ceiling to remove the remainder of the old paint. While you are sanding, remove any surface mold on the ceiling. Use joint compound and apply it to any cracks or pits in the ceiling with a putty knife. Don't worry if it is not perfectly flat. Just make sure that the cracks and holes are filled. Wait 24 hours for the compound to dry before sanding. Sand the surface with a 150-grit paper or finer to avoid scrape marks. Use a wet cloth over the entire ceiling to gently wipe off the dust. If dust gets in the paint, it will not stick as easily. Now you are ready to paint. Use an electric sander if possible. Electric sanders not only work much faster, but they also allow for a smoother finish. Consider installing a bathroom fan if you do not already have one. A fan will minimize moisture and will help prevent mold from forming on the ceiling, thus making your paint job last longer. 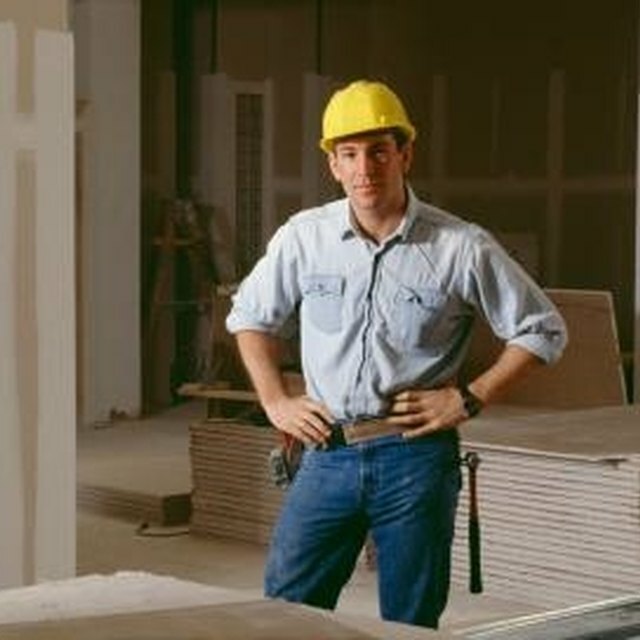 Take frequent breaks when working on a ceiling to avoid neck and shoulder strain. Always wear goggles and a mask while sanding and ceiling. The dust falls right onto your face. Don't use the shower for 24 hours after painting. What Is Wrong With a Popcorn Ceiling?